HTML5 Video Player is distributed as an Adobe Dreamweaver extension, packed as a file, named JQVideoPlayer.mxp. Read more in the online help. HTML5 Video Player is an invaluable widget that helps you easily embed video to website or blog. It allows you to create innovative media solutions for your site. Awesome look and wide range of settings take your development to a new level. Video player includes such favorite functions as autostart, play random, repeat, aside you can hide or reveal playlist. Playlist has two styles: it can show the list of tracks in rows or it can display posters (thumbnails) of the videos in a form of the image scroller. Player supports fullscreen mode. Component is platform independent, cross-browser compatible and works on PC and mobile devices. Player is very intellectual, it verifies if the web browser supports HTML5 or Flash and then uses the supported play method. As if browser doesnâ€™t support HTML5 video, component loads flash file as a backup. There is no need to tune it up through CSS to match your siteâ€™s theme, everything is realized through User Interface, so can be easily styled to fit perfectly your site and design. Player compatible with all modern browsers, platforms and also search engine friendly. Component is ready to work as soon as it appears on a page and is fast to respond. The installation package contains Dreamweaver extension, providing you the ability to easily create high-impact, HTML5-powered player, all in Dreamweaver CS3, CS4, CS5, CS6, CC 2014, 2015, 2017 and CC 2018. Using the user-friendly user interface, you can adjust colors, fonts, sizes, spacing and wide range of options that you can adjust according to your taste. 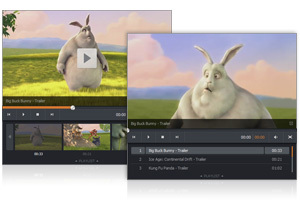 Video player is cross-browser and cross-platform compatible. As it supports devices using HTML5 and supports older browsers using a Flash fallback. 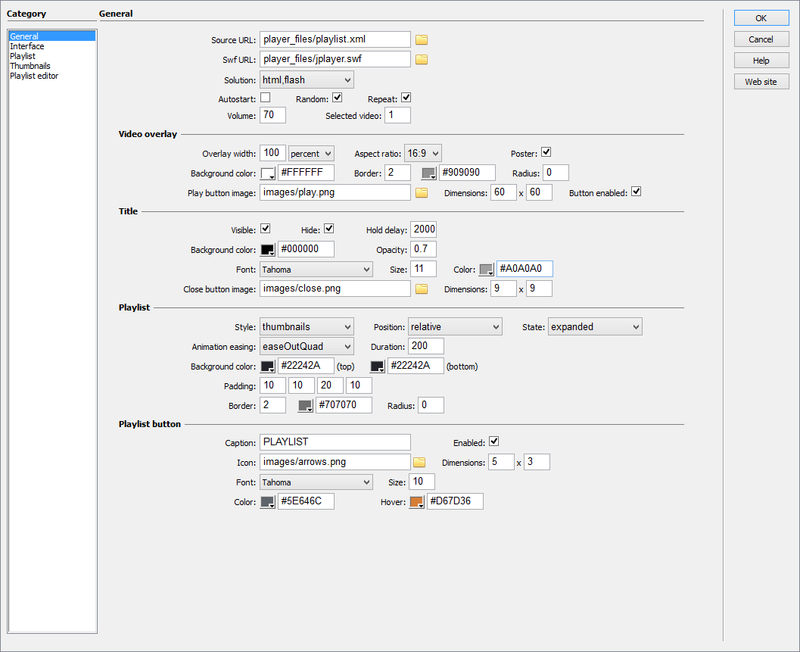 Video player supports different video formats: WEBMV, OGV, M4V and FLV. Playlist has two styles: it can show the list of tracks in rows or it can display posters (thumbnails) of the videos in a form of image scroller. Player body can be stretched. You can set 100% width so the layout adapts to the width of the browser window. Video player has playlist which you can hide or reveal and use mouse wheel to navigate through it. You can easily create necessary playlist using playlist editor. Through the playlist editor you can add or remove video tracks, titles and posters. Autostart, play random, repeat, and hiding playlist options. Also you can choose which buttons are visible. You have the option to add a link button to each video. You have the option to add a poster (thumbnail) to each video. Installation package contains Dreamweaver extension. 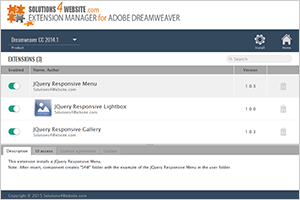 Dreamweaver extension allows you to easily create HTML5 player. Extension has user friendly interface.